ROME (Reuters) – Italy’s president is likely on Wednesday to appoint a mediator to try to break a deadlock that has prevented the formation of a government since inconclusive elections six weeks ago, a source said, although no quick breakthrough is expected. President Sergio Mattarella will probably ask Maria Casellati, the speaker of the Senate, to hold more flexible, less formal talks than those he has already led, a source close to the president told Reuters. The European Union’s third-largest economy has been under a caretaker government since the March 4 polls, when anti-establishment and far-right parties were the big winners at the expense of more mainstream groups. 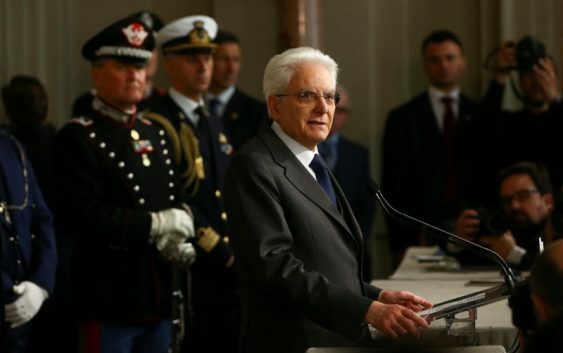 Two rounds of formal consultations between Mattarella and the parties have failed to break down apparently irreconcilable positions, and the stalemate is likely to persist until regional elections later this month, other political sources have said. Casellati is a member of the conservative Forza Italia (Go Italy!) party and she has always been close to its leader, four times prime minister Silvio Berlusconi. A conservative bloc comprising the League, the Brothers of Italy and Forza Italia won the most seats at the election, but not enough for a working majority, while the anti-establishment 5-Star Movement emerged as the largest single party. The 5-Star has said it is willing to govern with the far-right and eurosceptic League, but has ruled out working with the more pragmatic Forza Italia or its leader Berlusconi. The 5-Star, which bases its appeal on a promise to clean up politics, refuses to countenance a deal with the 81-year-old media billionaire who has a conviction for tax fraud and is on trial for bribing witnesses – a charge he denies. The 5-Star Movement and the League would have enough seats to govern, but the League’s leader Matteo Salvini has so far refused to abandon his coalition ally Berlusconi. The president has not yet decided whether to give Casellati an “exploratory mandate” to sound out the parties, or to ask her to try to form a government herself, the source said. It would be a major upset if Casellati were to become prime minister. But if the president appoints her as a mediator, she would be expected to focus her efforts on persuading 5-Star to drop its veto against Berlusconi and allow the formation of a centre-right coalition with the anti-system party. If 5-Star’s leader, 31-year-old Luigi Di Maio, continues to rule this out, she might then see if there is any chance of a deal between the centre-right bloc and the centre-left Democratic Party (PD) which has governed for the last five years. So far the PD, which lost badly in the election, has said it plans to go into opposition, rejecting appeals from 5-Star to discuss a possible coalition. The League’s Salvini has been adamant he will not govern with the PD. Berlusconi fared badly in the election, with his party unexpectedly overtaken by the League, and many observers were surprised when both Salvini and Di Maio agreed to back Casellati last month as Senate speaker. If Mattarella decides against appointing her, he could opt for lower house speaker Roberto Fico, from the 5-Star Movement. The appointment of a mediator may be no more than a way for the president to play for time. Political sources say the impasse is unlikely to be broken before local elections in the small regions of Molise in the south, on April 22, and Friuli Venezia Giulia in the north a week later. Both 5-Star and the League look unwilling to compromise while campaigning, with 5-Star hoping to win control of its first ever region in Molise and the League the hot favorite to win a clear victory in Friuli Venezia Giulia. If all efforts to break the stalemate fail, Mattarella would have to call new elections, almost certainly in the autumn. But the source in his office said he was determined to avoid this.